Are you excited about planning your next trip? Do you want to try something new? Would you like some guidance from a local? If you answered yes to any of these questions, then this Greater Than a Tourist audiobook is for you. 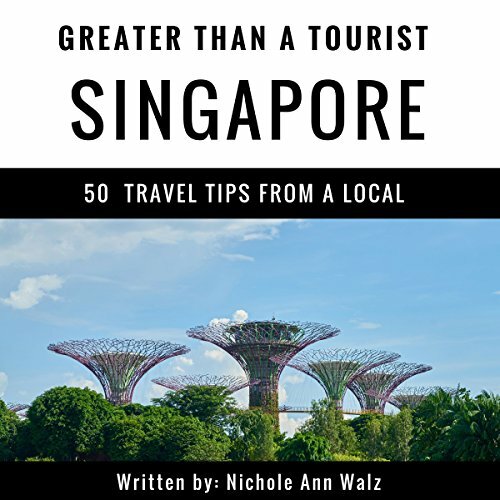 Greater Than a Tourist - Singapore by Nichole Ann Walz offers the inside scoop on Singapore. Most travel books tell you how to travel like a tourist. Although there is nothing wrong with that, as part of the Greater Than a Tourist series, this book will give you travel tips from someone who has lived at your next travel destination. Here, you’ll discover advice that will help you throughout your stay. This book will not tell you exact addresses or store hours but instead will give you excitement and knowledge from a local that you may not find in other travel books. Where does Greater Than a Tourist - Singapore rank among all the audiobooks you’ve listened to so far? For a people who want to visit the beautiful country as Singapore. Please listen to the beautiful voice of narrator John Fiore to give you the full tips about the local Singapore. It is well worth it. I love the tips of the local Singapore and its culture.